This week I’m very excited to share two great examples of how our schools created “teachable moments” for students, by incorporating aspects of our program into their curriculum. First is a 6th grade teacher at Santa Fe Waldorf School in NM. He came up with a great way to demonstrate a real life math lesson to his students, calling it their “Mark Up” math exercise. Students were provided with the product prices that the school would be charged. This is our wholesale price. 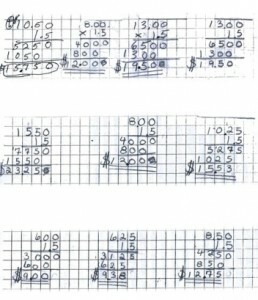 Then, based on the profit percentage the school had chosen for the program, the students were instructed to use their math skills to calculate what the price to families (retail price) would be, along with the profit the school would earn on each item sold. We love how he was able introduce a “real life” circumstance into the classroom, and then show students how to apply their understanding of math to the situation. The students did a great job, and the teacher even made the Original Works Sales Representative correct the papers! The second example is from one of our art teachers at Westgate Community Charter. She decided to use our program as a way to introduce the concept of planning and teamwork to her pupils. Students in 7th & 8th grade helped prepare the packets that were sent home to the families. Then students in other grades were assigned tasks such as marketing, promotion and order coordination so that the entire school was involved. We love this integrated approach to teaching and learning, and are sure that the students not only gained great hands on experience, but also a sense of self-satisfaction. Do you have some examples of how you’ve incorporated your fundraising programs into other areas of your student’s curriculum? If so, then please share them with us. For more ideas on how fundraisers can provide multiple benefits to students and schools, visit our blog on How Fundraisers can benefit your Elementary School.